Hi guys! I try not to post more than once a day, but today I wanted to hook you up with one of the dishes I make from the marvelous Sweet & Sour Country Style Ribs I put out earlier. This is a beautiful thing. The flavor is intense, the sauce lovely and silky, and while I make Pork & Mushroom Ragu when I have a little of the Sweet & Sour Country Ribs leftover, I also have this in mind when I have any leftover Pulled Pork, too. And I imagine this would be a great way to work over any leftover pork chops, especially if they’re on the drier side and you’re stumped on how to make them taste great on a second go round. I’m not really sure why I call this “ragu” since it doesn’t really lean towards the Italian side of food, but it is pork slowly cooked down into lusciousness and that reminds me of some of the meaty, braised ragu sauces you see served over pasta. Except for the flavor! The flavor of your Pork & Mushroom Ragu will obs take on a little of flavor of whatever pork you make it from – and that’s a beautiful thing! Just think of it; most of the work (and most of the time invested) is done with the original dish. You’ll spend about 20 – 25 minutes on the Pork & Mushroom Ragu – and you’ll have all the taste and complexity of a long, slowly braised dish. I love to add in the mushrooms to Pork & Mushroom Ragu because they help stretch any bit of leftover pork you might have and they’re “meaty” on their own. Just a warning: the final dish is so rich with the reduced liquid, that you’ll want to serve small portions, and serve it over something. I like to serve the Pork & Mushroom Ragu over polenta, like my Instant Pot Polenta or a classic polenta you’ll find on my recipe for Chorizo Polenta Bites. Pork & Mushroom Ragu is fantastic over the polenta you buy at the store in little tubes, too, but the Chorizo Polenta Bites recipe will show you how to do a home version of that product. I also think Pork & Mushroom Ragu is just great over grits, as shown in the photos. Those are my (Instant) Cheesy Grits made with Parmesan instead of Cheddar and milk instead of cream. And of course, you can never go wrong if you want to top mashed potatoes, noodles or rice with your Pork & Mushroom Ragu. You might even want to try this recipe with barley or barley risotto. Pork & Mushroom Ragu is so simple, so easy & so forgiving. As I mentioned above, you can start with just about any leftover or cooked pork you might have. And while it’s quickest if you start with a pork that’s already super tender and shreddable, like any of the country style ribs or pulled pork recipes on my site, this recipe will even revive old pork chops. You just add them in and gently simmer and give the reduction a little more time. This is an absolutely perfect recipe to use if you’ve made your pork in the Instant Pot or Slow Cooker and have a lot of extra liquid from the cooking process. You might have that from an oven braised pork dish, too, but it’s not likely you will have any liquid to speak of with smoked pork. In that case, just use a good stock, instead. And if you don’t have enough liquid from the pork, just top it off with a little stock. I’m all about simple these days, and you can see that this recipe is just that! If you’d like, chop an onion and saute it with the mushrooms, maybe add a little garlic or any spices or herbs that strike your fancy. I find that most of the Pork Recipes I make have plenty of flavor in this recipe just as is. Since we already talked about saving money on the ribs on the Sweet & Sour Country Style Rib post, let’s talk about mushrooms. Mushrooms go on sale regularly & keep well for days to a week or so. I turn the package upside down and poke a couple of small holes in the bottom side and then store them upside down. Best of all, the simple button mushroom, nutritionally speaking, has the same powerhouse of nutrients as their pricier counterparts. What you’re going to nap your Pork & Mushroom Ragu is going to reflect in the cost of your meal. I’m up Nord (Twin Cities) so we’re lucky to find any grits, but if you live in an area where they’re more common, watch for sales. And freeze them for three days when you bring them into the house; do that with any flour or corn-based product and you’ll find you’ll cut back on the possibility that there might be any peskies to deal with later. You have a whole range of options when you put polenta on the table, from pricey imported to the refrigerated tubes, but my go-to is to simply make my polenta with cornmeal. If you use potatoes, buy them in the larger bags and store them in a cool, dark place away from onions. Noodles of all types go on sale regularly, so watch for sales and stock up. Rice is going to be your most cost-effective option, but not top on my list, personally, for this recipe. * Note: Time is dependent upon having the leftover braising liquid & some of the meat from the Sweet & Sour Country Style Ribs or another tender shreddable pork dish. See note, below. In a small saucepan or a skillet, melt butter or add olive oil over medium-high heat. Add mushrooms and saute two or three minutes, until lightly browned and giving up the juices, stirring now and then. Add the braising liquid, bring to a boil and then turn down to a vigorous simmer until reduced to a sauce-like consistency, about 15 to 20 minutes. Turn heat down and add the pork, shredding if needed, into chunks. Gently warm through. Taste for salt and pepper and add if desired. Serve with parsley and/or Parmesan cheese over polenta, grits, pasta, mashed potatoes or rice. Note: If starting with pork that isn’t cooked to the point that it will shred, leftover pork chops, for instance, cut into small pieces, about an inch to an inch and a half or so and add at the same time the liquid is added. Simmer gently rather than vigorously, until the pork is tender, then turn the heat up to reduce the sauce. If needed, add more stock. I’m linking Pork & Mushroom Ragu up at Fiesta Friday, hosted this week by Jhuls @ The Not So Creative Cook and Elaine @ Foodbod. 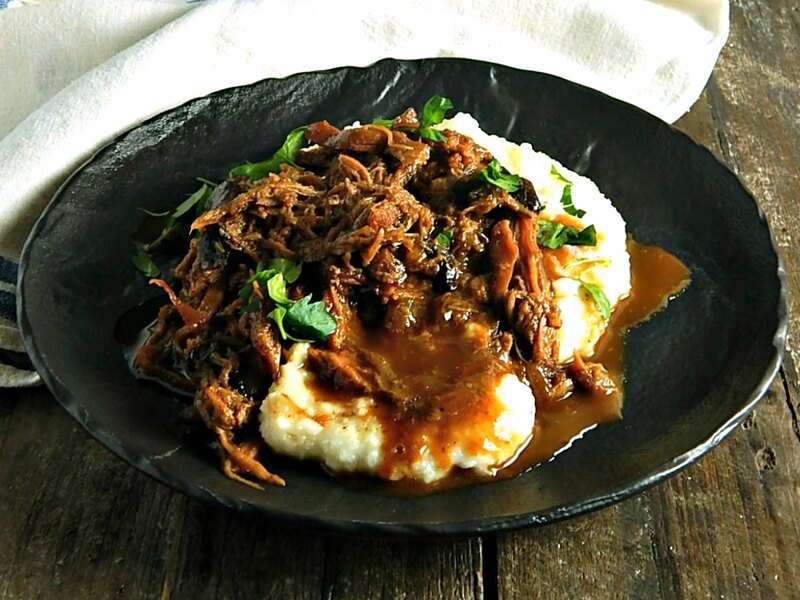 This entry was posted in Click here for Bargain Meals, Click here for Fabulous Food Posts and tagged Bargain Meal of the Week, country style ribs, Grits, leftover pork, leftover pulled pork, mushrooms, polenta, Pork, Pork & Mushroom Ragu, Pulled Pork. Bookmark the permalink. Thanks, Rhonda! Being such a northerner, I didn’t really appreciate grits….until I started seeing recipes with cheese in them, lol!! Loved the mushroom trick. Accompanying with polenta sounds it very interesting. The polenta is a little different and very fun. Thanks, Sumith. That is a great mushroom trick. I’ll be giving that a go. And great recipe to boot. Hi Virginia! 🙂 Tax season’s over!! 🙂 I can tell by the date and we get to see more of you! 🙂 The ragu was really incredible and rich from all those braising juices. And we all make such different dishes, and the beauty of FF is seeing all that creativity and action in other people’s kitchens, even if its not to our tastes. I appreciate what everyone brings, even if I wouldn’t eat it! I find it really difficult because there are some things that I just wouldn’t even have in my vicinity, but they still show such creativity and deserve to be applauded! But then…not everyone would eat what I make, so it’s swings and roundabouts isn’t it?! I know exactly what you mean! I learn so much when I host because I visit every single post and read them carefully…the range of recipes and ingredients is truly astounding and from visiting other link ups, I know FF gets some of the best bloggers and Angie has truly built a community! She has! There’s a very strong core of FF cooks. And lots of new people linking up that I’ve never seen before too. Hey, it’s 6.15am here, what time is it with you?? It was about 1:30 am – I have persistant insomnia! I’ve never heard of that mushroom storage trick. I definitely need to give that a try! I have been on a bit of a polenta kick lately and that ragu looks sooooo good! I have got to stop by, Carlee! Things have been so crazy here and I’m missing you and your incredible recipes! Are you still working your way through all that cornmeal?!! Wow looks great! And I love the mushroom trick, I’ll have to try that!